Newsroom > 2018 > ICE cosmos: a galaxy of sparkling dials. What is Ice-Watch’s treat for the festive season? The chance to shine brightly. Now more than ever. 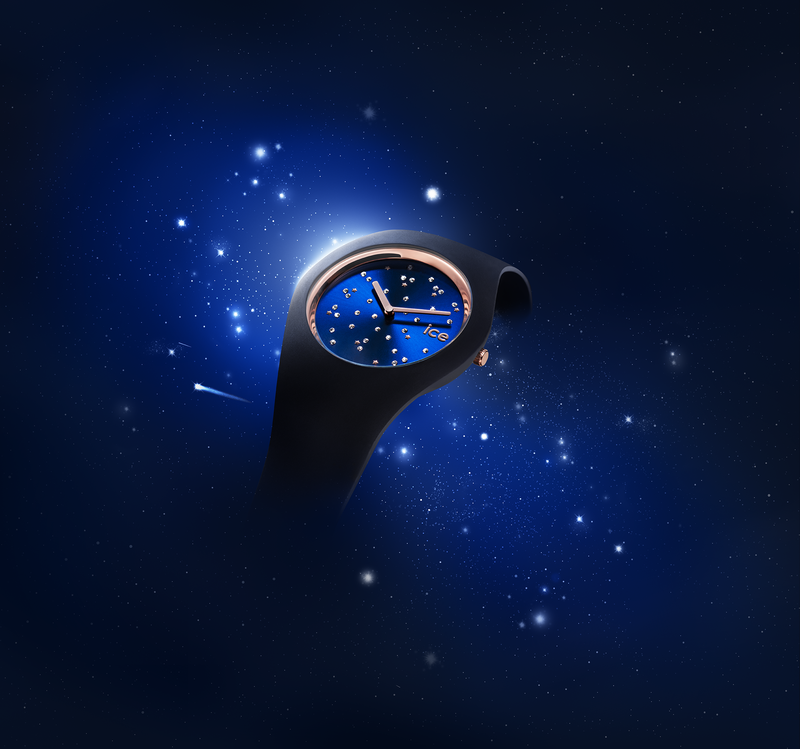 This is the reason behind the new ICE cosmos collection: 8 dress watches with a galactic shine. Each of these feminine and refined watches radiate ultra-stellar charm, dazzling with crystals from Swarovski®. Choose between the colour of clear ice or multi-coloured, each dial contains a crescendo of sparkles. This discretely lights up the time with brilliant detail. The bright colours make the watch face sparkle like colourful sapphires. Its glamorous look is a glimpse into the magical vault of heaven with an iridescent electric blue or white sky that catches the eye like a satellite. Bezels and hands in gold or rose gold, a palette that soars from intense blue to snow white, from tender rose to onyx black: the ICE cosmos is cosmic chic! The collection suits any time of day or night, enhances every look with a touch of shine and elevates all outfits as the accessory that shuns unnecessary extravagance. The ICE cosmos watches are available in medium (40 mm) and small (34 mm) and make the perfect gift, for yourself or a loved one. No matter the recipient, the Ice-Watch effect will always be the same: stars in the eyes, dreams in heart. Ice-Watch is a Swarovski Ingredient Branding partner.